Will you be one of the first people here when we open at 10am on Record Store Day, April 13? The first 33 customers in the shop will get a FREE Backbeat tote with lots of great freebies inside. It’s like a Record Store Day loot bag! 10 lucky people will have the exclusive Polaris Collaboration Session 7” featuring Jennifer Castle & The Weather Station in their tote! If you miss out on the Polaris 7” don’t worry you’ll still get some Backbeat swag, a flexi disc from Pirates Press and more! We will also be having prize draws all day and you could win a Music Hall USB-1 turntable ($350 value) or one of 8 Perth Brewery giftcards ($25 value). 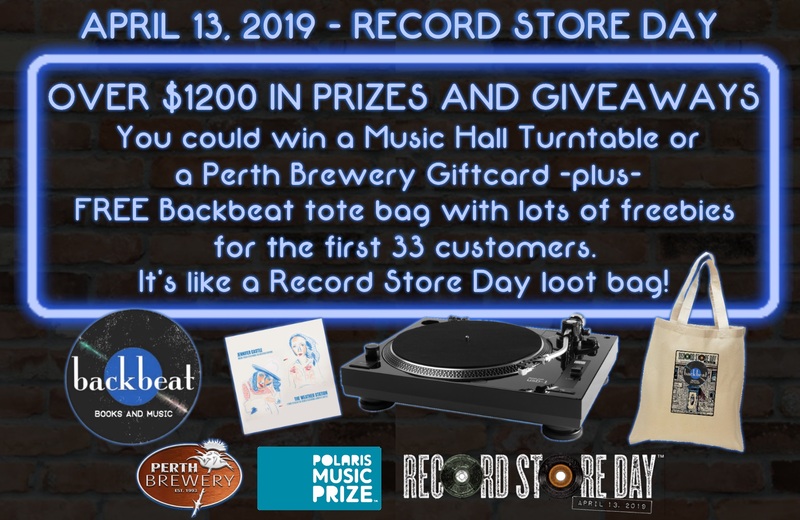 That’s over $1200 in prizes and giveaways right here at Backbeat on Record Store Day, April 13, 2019! August 8, 2018 Get AMPED at Backbeat! Big Sale on Audio Gear.